Hughes' H-4 Hercules Flying Boat, better known as the "Spruce Goose," is the centerpiece of a new Northwest aviation museum opening this week in McMinnville, Oregon. The Hughes H-4 Hercules is an aircraft designed and built by Howard Hughes's Hughes Aircraft company. 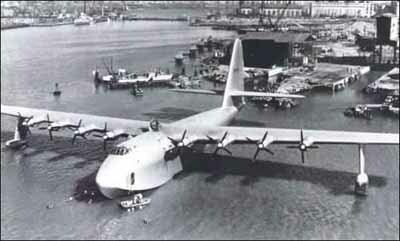 The Hercules is the largest flying boat, and has the largest wingspan of any aircraft in existence. Only one was ever built. Due to wartime restrictions on the availability of metals, the H-4 was built almost entirely of laminated birch, not spruce as its nickname suggests.